Purpose: Motivational Interviewing (MI) is an evidence-based, patient-centered counseling approach for eliciting behavior change. In 2012, the University of Michigan (U-M) Dental Hygiene Program significantly enhanced their behavior change curriculum by reinforcing and building upon the Motivational Interviewing segment. The purpose of this study was to examine students' perceptions of the importance of MI and their confidence in applying it during patient care. Methods: A convenience sample of 22 U-M Class of 2015 dental hygiene students who had received an enhanced curriculum participated in this study, utilizing a retrospective, pre-test/post-test design. Results: A Wilcoxon signed rank test was used to compare the differences in average ranks between T1 (Retrospective Pre-Test) and T4 (Post-Test 3) for the importance and confidence questions at each time point for the Class of 2015. Students' perceptions of importance increased with statistical significance in five out of eight MI strategies. Perceptions in confidence increased in seven out of eight strategies. Effect size ranged from .00 to .55. Assessment of qualitative data provided additional insight on student experiences. Conclusion: Student perceptions of importance of using MI and their confidence in applying MI increased in a majority of the strategy categories. Successes with patient health behavior change and challenges with time to integrate this in practice were noted. Research on the longitudinal impact and faculty feedback calibration is recommended. Oral health has a significant impact on overall health.1-4 Major oral diseases include dental caries, periodontal diseases, and oral and pharyngeal cancers.1-5 While the majority are preventable, millions of Americans suffer from these debilitating conditions.2-5 Patient adherence to recommended treatments and healthy behavior changes are essential in preventing and treating oral diseases. In 2012, the University of Michigan (U-M) Dental Hygiene (DH) program embarked on a project to enhance their health behavior curriculum with a special focus on MI. The desired outcome was for students to translate content learned in the classroom to clinical application during patient care. The purpose of this study was to examine U-M dental hygiene students exposed to the enhanced MI curriculum and to assess both their perceptions of the importance of using MI and their confidence in applying it. Croffoot et al. studied the effects of coaching dental hygiene students taught to use MI strategies.11 The results indicated that education, in combination with faculty coaching/feedback, provided achievement of core MI skills and increased MI adherence by the students.11 In order to be proficient with MI and develop confidence in its application, exposure is needed early in the curriculum along with continuous reinforcement integrated throughout the entire curriculum.11 Real skill and confidence grow through rigorous practice, feedback, and coaching from a knowledgeable guide.20 MI skills were developed throughout the dental hygiene program as students were developing clinical skills. Importance and confidence play important roles in the likelihood that students will incorporate MI into their professional practice.30 The purpose of this study was to examine U-M dental hygiene students exposed to the enhanced MI curriculum and to assess their perceptions of the importance of using MI and their confidence in applying it to patient care. This study was presented to the Institutional Review Board at the University of Michigan. It was approved as “exempt.” A convenience sample of 22 first-year University of Michigan (U-M) dental hygiene students from the Class of 2015 participated in this study that ran for two semesters. In the winter of 2013, the enhanced MI curriculum was launched. Prior to this, the students' exposure to MI consisted of a didactic session during the Health Education Methods course that also focused on the Stages of Change and Health Belief Models. There were no assignments integrating the application of MI. 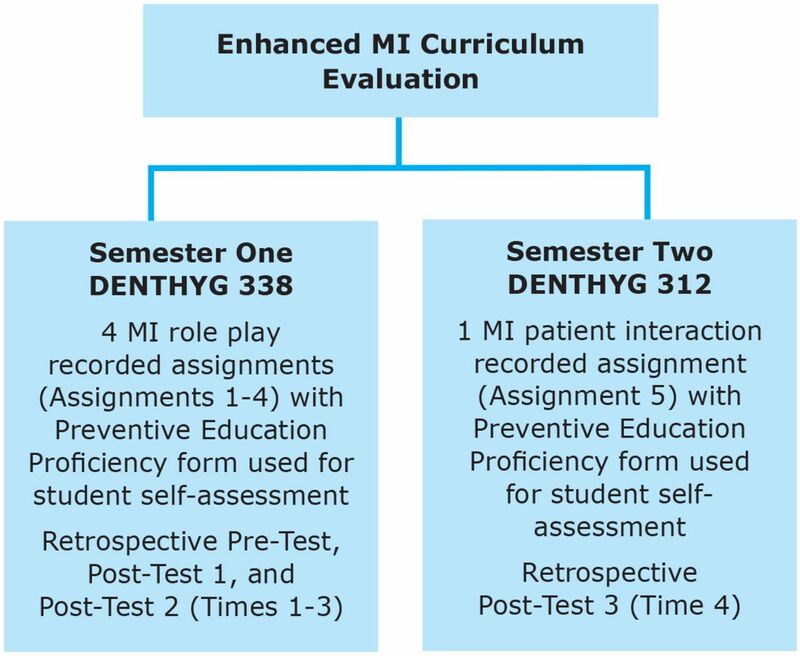 Figure 1 provides an overview of the enhanced MI curriculum evaluation timeline. During the first semester of the study, the students were enrolled in DENTHYG 338-Health Education Methods, a course that takes place during the second semester of the six semester dental hygiene program. The second semester of this study focused on the application of MI during patient care and was facilitated in DENTHYG 312-Clinical Dental Hygiene Seminar, a course that takes place during the third semester of the six semester dental hygiene program. During the 10 consecutive fifty-minute sessions of enhanced MI education and skill instruction presented in Health Education Methods, students were assigned to read MI literature, watch videos depicting scenarios of a MI counselor with a patient followed by group assessments of the interactions. Students were also required to complete four audio-recorded role-play assignments applying MI skills (Figure 1) The four evaluation instruments used in semester one of this study were adapted from those used by the University of Missouri-Kansas City Dental Hygiene Program during the assessment phase of their Motivational Interviewing curriculum. Modifications were completed in consultation with U-M's Center for Research on Learning and Teaching (CRLT). The modified instruments were then pilot-tested and the recommendations were incorporated. In addition, the “Preventive Education Proficiency” form was utilized throughout this study. Both students and faculty used this proficiency form to assess audio-recorded MI role-playing interactions. Ten of the criteria focused on application of specific MI strategies such as asking permission, use of open-ended questions, reflection, affirmation, and summary. Two criteria asked students to self-assess their perceptions of the importance of using MI and confidence in applying MI techniques. Students were required to complete four audio recordings. Assignment #1 focused on the students' application of open-ended questions, affirmations, reflective listening, and summarizing (OARS) principles. Assignments #2 and #3 were combined assessing additional MI strategies of complex reflection and eliciting change talk. Assignment #4 asked the dental hygiene student to assimilate and apply all MI strategies during a recorded interaction with an acquaintance. A Retrospective Pre-Test was delivered to the Class of 2015 at the end of the 10 MI class sessions in DENTHYG 338 - Health Education Methods. This assessed the students' perceptions of how important they believed utilizing the MI counseling strategies were before the start of the course. This also assessed student confidence with using MI prior to DENTHYG 338. The MI strategies evaluated included: using open-ended questions, listening reflectively, making affirmations, summarizing, eliciting change talk, using the importance ruler, asking for elaboration, and enhancing self-efficacy. The Retrospective Pre-Test collected both importance and confidence responses using a Likert scale. Demographic information was also gathered. Post-Test 1 was delivered to the Class of 2015 at the end of the 10 MI sessions in DENTHYG 338. Post-Test 1 assessed the students' perceptions of the importance of MI and their confidence in using it after completing the educational training. It utilized the same questions and Likert scale response options as the Retrospective Pre-Test as Post-Test 2. Post-Test 2 was delivered to the Class of 2015 on the last day of class, in order to measure the students' perceptions five weeks after the completion of the MI content in the course. In the fall of 2013 during DENTHYG 312 - Clinical Dental Hygiene Seminar, the Class of 2015 completed a worksheet asking for a critical analysis of the change talk and commitment strategies as demonstrated in a video shown during class. In addition, the students participated in a 110-minute class session delivered by an expert in the area of MI. This presentation focused on eliciting change talk and setting the agenda for change with patients. During the second semester, students were also required to audio record an educational interaction with a patient in clinic (Assignment 5). Using the Preventive Education Proficiency form, students self-assessed their interaction, including their perceptions of importance of MI and their confidence in applying MI techniques. The team of faculty members also used this proficiency form to assess the students' recorded interactions and provide feedback. Post-Test 3 was administered to the Class of 2015 at the end of the fall 2013 semester. The Post-Test 3 was used to again measure students' perceptions of the importance of MI and their confidence in using MI in delivering health education, with additional open-ended questions included. SPSS version 21 was utilized for data analysis. Descriptive statistics for the Class of 2015 are provided in Table I. Definitions of MI skills assessed “in this study adapted from Miller et al6 are summarized in Table II. Confidence in “open ended questions,” “making affirmations,” “summarizing,” eliciting change talk,” “using the importance ruler,” “asking for elaboration,” and “enhancing self-efficacy” was found to be significant (p<0.05) over time. No significant changes were found for “listening reflectively.” Effect size was calculated using r-squared and ranged from .00 to .55. Using the Preventive Education Proficiency form, self-perception of the importance of MI and confidence in applying MI skills was evaluated for the Class of 2015 using a Wilcoxon Signed Rank Test (Table IV). Change in students' importance and confidence scores over time was not statistically significant. Effect size was calculated using r-squared and ranged from .01 to .07. The Class of 2015 used the Preventive Education Proficiency form to self-assess their perception of the importance of MI and their confidence in applying it at the completion of each of the five MI recording assignments over the two semesters. Overall importance and confidence increased however, the increase was not statistically significant. This could be due to the small, three point scale used, not allowing for enough variance in responses. Consideration should be given to revising the proficiency assessment to include a broader response scale. This study had limitations; the small sample size and the lack of a control group. Development of interpersonal communication skills should involve practice and be closely evaluated.9,10 Training research indicates that proficiency in MI is not readily developed through self-study or by attending a workshop, but typically requires practice with feedback and coaching over time.11,20 It is recommended that the U-M Dental Hygiene Program continue this study longitudinally so the outcomes from the Class of 2015 can be determined following three full years of the enhanced MI curriculum. This study found students' perceptions of the importance of MI and their confidence in applying MI strategies increased over time. Students identified important successes when applying MI and also identified realistic challenges in the process. These findings supported that the enhanced curriculum had a positive outcome on students' ability to learn important MI concepts and apply these in health behavior change interactions. Future research should focus on measuring student performance related to patient health behavior change outcomes longitudinally. In addition, additional studies should concentrate on faculty feedback and coaching calibration. The authors wish to thank Kimberly Bray, RDH, MS and Delwyn Catley, PhD, from the University of Missouri-Kansas City, for their guidance during this project. Gratitude is also extended to Dina Korte, RDH, MS and Giselle Kolenic, BA, MA, from the University of Michigan, for direction, dedication, and support. Angela Mills, RDH, BSDH, MS, is a 2014 graduate of the Master of Science in Dental Hygiene Program, University of Michigan School of Dentistry, Ann Arbor, MI, and an adjunct faculty member at Oakland Community College, Highland Lakes, MI. Wendy E. Kerschbaum, RDH, MA, MPH, is an Associate Professor Emerita; Philip S. Richards, DDS, MS, is a Clinical Professor; Janet S. Kinney RDH, MS, is Director of Dental Hygiene and a Clinical Associate Professor; and Anne E. Gwozdek, RDH, BA, MA, is a retired Clinical Assistant Professor; all in the Department of Periodontics and Oral Medicine, University of Michigan School of Dentistry, Ann Arbor, MI. Gail A. Czarnecki, DDS, is a pediatric dentist in private practice in Arlington Heights, IL. This manuscript supports the NDHRA priority area, Client level: Oral Health Care (new therapies and modalities).
. A national call to action to promote oral health. Rockville, MD: U.S. Department of Health and Human Services, public health service, Centers for Disease Control and Prevention, and the National Institutes of Health, National Institute of Dental and Craniofacial Research. NIH Publication No. 03-5303, May 2003.
. Motivational interviewing in healthcare. New York: Guilford; 2008. 210 p.
. Patient adherence and medical treatment outcomes: a meta-analysis. Med Care 2002 Sep;40(9):794-811.
. What is motivational interviewing? Behav Cogn Psychother. 1995 Mar;23(4):325-334.
. Health behavior change in the dental practice. Ames (IA): Wiley-Blackwell; 2010. 177 p.
. Evaluating the effects of coaching to improve motivational interviewing skills of dental hygiene students. J Dent Hyg. 2010 Spring;84(2):57-64.
. Toward a theory of motivational interviewing. Am Psychol. 2009 Sep;64(6):527–537.
. Motivating mothers to prevent caries: confirming the beneficial effects of counseling. J Am Dent Assoc. 2006 Jun;137(6):789-793.
. Motivating parents to prevent caries in their young children: one-year findings. J Am Dent Assoc. 2004 Jun;135(6):731-738.
. The multilevel compliance challenge: recommendations for a call to action. Circulation. 1997 Feb;95(4):1085-1090.
. Motivational interviewing with problem drinkers. Behav Psychother. 1983 Feb;11(2):147-172.
. An individually tailored treatment program for improved oral hygiene: introduction of a new course of action in health education for patients with periodontitis. Int J Dent Hyg. 2009 Aug;7(3):166-175.
. Motivational interviewing: a systematic review and meta-analysis. Br J Gen Pract. 2005 Jun;55(513): 305-312.
. Physician communication and patient adherence to treatment: a meta-analysis. Med Care. 2009 Aug;47(8):826-834.
. Ten things that motivational interviewing is not. Behav Cogn Psychother. 2009 Mar;37(2):129-140.
. Assessment of a motivational interviewing curriculum for year 3 medical students using a standardized patient case. Med Educ. 2010 Jul;84(1):27-30.
. motivational interviewing on clinical outcomes following periodontal maintenance therapy. Int J Dent Hyg. 2012 May;11(2):134-141.
. A randomized trial of methods to help clinicians learn motivational interviewing. J Consult Clin Psych. 2004 Dec;72(6):1050-1062.
. Health care practitioners' perceptions of motivational interviewing training for facilitating behavior change among patients. J Allied Health. 2012 Fall;41(3):131-139.
. A new curriculum using active learning methods and standardized patients to train residents in smoking cessation. J Gen Intern Med. 2003 Dec;18(12):1023-1027.
. Teaching students' behavior change skills: description and assessment of a new motivational interviewing curriculum. Med Teach. 2007 May;29(4):e67-71.
. Concept analysis: confidence/self-confidence. Nurs Forum. 2011 Oct-Dec;46(4):218-230.
. Improving medical students' success in promoting health behavior change: a curriculum evaluation. J Gen Intern Med. 2008 Sep;23(9):1503-1506.
. Motivational interviewing in dental hygiene education: curriculum modification and evaluation. J Dent Educ. 2013 Dec;77(12):1662-1669.
. Barriers to providing nutrition counseling by physicians: a survey of primary care practitioners. Prev Med. 1995 Nov;24(6):546-552.
. Effectiveness of a motivational-behavioural skills protocol for oral hygiene among patients with hyposalivation. Gerodontology. 2014 Dec; 31(4);28-95.